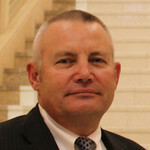 Dr. Robert E. Springs, Jr.
Robert E. Springs, Jr. is the Chief Executive Officer and President of Global Resource Services, Inc. (GRS), a not-for-profit humanitarian aid and development-consulting firm (www.grsworld.org). Mr. Springs works with key Governmental, UN, and NGO partners to develop diversified and comprehensive approaches to US/DPRK relationships. Robert worked in the fields of construction, fire fighting, emergency medicine, and education before concentrating his efforts in international development. Mr. Springs and his wife founded GRS with a vision to set the standard for humanitarian aid and international development. He and his GRS staff have coordinated the distribution of over 20,000 tons of relief goods, managed multiple development projects, and actively engaged in international diplomacy. Robert holds a Bachelors of Science Degree in Secondary Education with an emphasis in Health and a minor in Speech Communications; a Masters in Intercultural Studies; and a Doctorate with an emphasis in International Development and Cultural Anthropology. His vocational and academic focus since 1984 has been immersed in Northeast Asia as a student and practitioner.